The new €115m state-of-the-art facility, Frankfurt North, immediately adjacent to the existing Frankfurt South data centre, will provide around 11,000 sq m of gross space with 14MVA of utility power, bringing the total power capacity of the campus to 28MVA. As part of the development, a striking new reception area will be incorporated, linking the two data centres, giving an enhanced customer experience. In addition, Frankfurt South will undergo a large programme of upgrading and enhancing the facility’s infrastructure, as well as a complete façade renovation to ensure that the visual finishes complement the new data centre. Frankfurt North will be a leading example of an environmentally sustainable data centre with energy efficiency at the heart of its design. 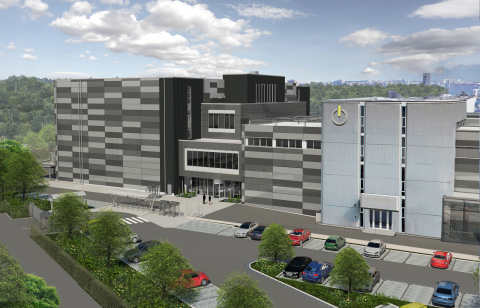 The data centre will feature high efficiency static UPS and an advanced Chiller Assist system using both hybrid dry coolers and water-cooled chillers, resulting in the chillers operating for less than 10% of the year. The facility will benefit from an independently verified annualised design Power Usage Effectiveness (PUE) of less than 1.2, and will be targeting a BREEAM "Very Good" certification. Frankfurt North is due to launch in 2019 and will add to the campus’ reputation as one of the most important connectivity hubs in Germany and beyond. In total, the two data centres will provide four diverse entry points and four interconnected Meet Me Rooms. Customers will have a wide choice of cloud and network providers, and the presence of the DE-CIX peering platform ensures that they will also have direct access to the global IP backbone. In addition to strong demand from cloud providers, financial institutions and multi-national companies requiring highly resilient and secure space for housing mission critical IT equipment, Daily-Tech, who is a strategic partner of China Telecom Global, has taken a substantial pre-commitment for data centre services in Frankfurt North. John Corcoran, CEO of Global Switch, said: “Frankfurt North will be our thirteenth data centre and is part of a major expansion strategy in existing and new markets across Europe and Asia-Pacific with additional developments underway, including Hong Kong and Singapore. We are delighted that Daily-Tech has chosen Global Switch for its first data centre deployment in Europe, and is further demonstration of our strong relationship and commitment to proving highly resilient and secure solutions to our customers”. Aman Khan, Managing Director for Global Switch Frankfurt, added: “Frankfurt North has been designed as a market leading, energy efficient data centre offering customers scalable and flexible solutions which can be adapted to individual requirements. Customers will benefit from 100% green energy and, due to the low PUE that the data centre will achieve, an extremely attractive total cost of occupation”.